Thanks to Santa Rosa's two newspapers, we know pretty much everything newsworthy that happened in town a century ago, that being an era when newsworthy was writ with a small "n" - broken bones were mentioned, as was anyone's day trip to San Francisco and who invited who over for a hand of cards and a bite of pie. What's missing from the picture are details of how they spent their unexceptional moments. Could kids play in the streets after school? What did adults do on an average weekend? Where did someone dispose of non-burnable trash? How much did they rely upon their new home telephones for conversations with friends and family just across town? None of this is important stuff, but these hard-to-answer little questions - and a thousand more - remind that we really don't know much about what it was once like to live in our town, even in the reasonably recent past. These thoughts popped up while looking at photos in "Illustrated Portfolio of Santa Rosa and Vicinity," a 1909 book put together by the Chamber of Commerce and the Press Democrat. The contents are quite the mishmash; some photographs come from older PD promotional supplements on the wonders of Sonoma County, and many portraits of residential houses probably came from that paper's unproduced 1905 special section on the "Homes of Santa Rosa." There are postcard views and grade school class pictures and the error of using a circa-1902 photo of the firehouse destroyed in the Great Earthquake. But the work is still quite the treasure because image quality is so high, thanks to H. A. (Herman August) Darms, a skilled Napa photoengraver. The Portfolio has only a few interior shots of homes, social lodges and businesses, but they're indistinguishable from many other pictures of rooms during that same period, which seem to share a common problem: Really, really bad lighting. From the ceiling of each room were chandeliers or pendant electric lights. In daytime, natural light softly filtered through blinds or window lace, but after dark illumination would be turned inside out, as each room blazed from a cluster of overhead suns. Rarely visible were floor or table lamps with shades, or wall brackets/sconces for muted light. These would be rooms with deep shadows in every corner. There were exceptions to the ceiling light norms, of course. Comstock House, designed in 1904, has electric or gas/electric wall brackets in almost every room, and many have no ceiling fixtures at all. 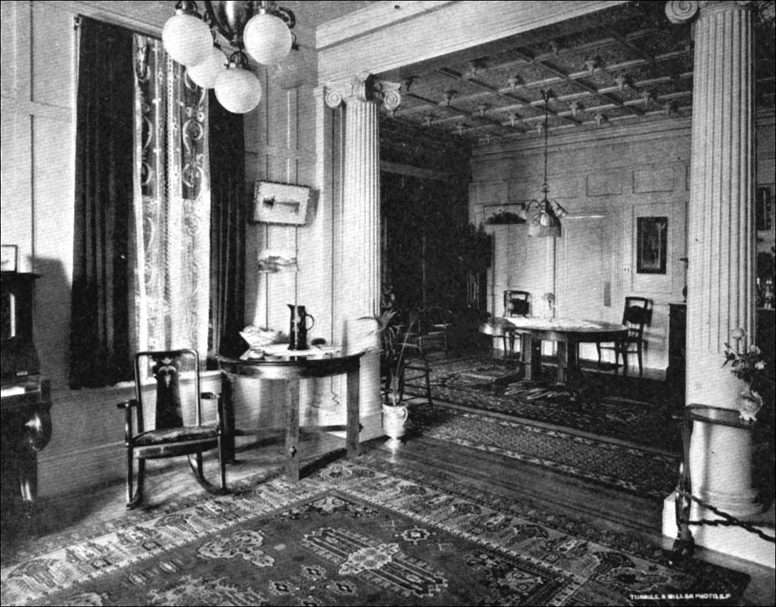 In fact, ceiling lights were installed in all bedrooms, per the blueprints, and removed in the early years (possibly because the 1906 quake ruptured or made suspect the gas lines to the second floor). Clearly, indirect lighting from the side suited the first-owner Oates family just fine. More typical was the home of Frank Brush, as pictured in the Portfolio (Mr. Brush, BTW, went down in Santa Rosa history as the human rope in the 1905 battle of Sebastopol Avenue tug-of-war). These views show rooms with only multiple light ceiling fixtures in each room - fine for playing cards or entertaining visitors, but terrible for personal activities like reading and letter writing. Does this mean that the Brush family was less bookish than the Oates? 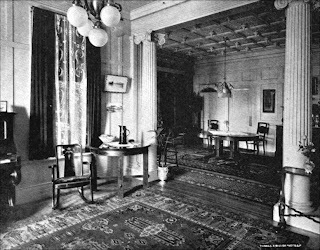 Of course not; there might have been an unphotographed parlor or family room, for starters. For three years, two of the largest companies in the world battled for dominance of a market worth untold billions of dollars. No, it's not today's competition between Apple and Samsung for the most popular smartphone; the fight was between General Electric and Westinghouse for the most popular light bulb, and the years were 1907-1910, when a billion dollars really meant something. Between 1907 and 1910, carbon (both original recipe and GE's improved "GEM" brand), tantalum and tungsten bulbs were all in common use. The sturdy tantalum lights, made by Westinghouse until 1910, were used in factories that operated their own generators (not at all uncommon in that day) and were always found on trains and trolleys. The tungsten bulbs were far brighter and lasted longer, but quickly earned a bad reputation. GE had rushed its technology to market too early in 1907 (not 1910, as claimed on almost all Internet websites). The filament broke easily from vibration and the earliest version only worked when hanging downwards because it relied upon gravity to keep the coils of soft tungsten filament from collapsing. The tungsten bulb factory also had QA problems, and 1 in 6 bulbs burned out within a few hours. Still, when it worked it worked well; up to 100w and lasting 750-1000 hours. General Electric discovered how to support the tungsten filament so it could operate in upright or sideways positions and made improvements that resulted in sturdier and cheaper manufacture. By 1910 GE had almost a complete monopoly on new bulbs sold in the United States, and the company's main competitor was...itself. GE still made its "GEM" brand of carbon bulb which it continued to advertise as the "improved" light bulb, and the company likewise boasted its tungsten bulb was "improved." In the 40-60 watt range used in the home or office, people couldn't tell the difference in brightness, and the carbon bulbs may actually have lasted longer at this lower wattage because of thicker filaments. The product confusion finally ended when Congress banned the production of carbon filament lights in August, 1918 because of war-related coal shortages (and perhaps, a little GE lobbying). Lamps also may not be pictured because the Brush family (and most everyone else) probably still had the 19th Century habit of carrying light around with them. Mantle and wick lamps were still advertised in the papers, and kerosene was easy to buy. Put a nice glass Welsbach mantle lamp, with its bright and steady light, on that table by the rocking chair and it becomes a cozy spot to read the paper while listening to Precious Child bang away on that partially-seen upright piano. We can be certain that hand-carried lamps were in widespread use because electrical service in these years was unpredictable. As in the previous five years, in 1908 the "juice" would still go off for hours for no apparent reason, driving Santa Rosans to fury. Kerosene lamps might also be preferred because electricity was so costly; for the pleasure of using this (dis) service, a 1905 article revealed customers were charged about the same per Kwh as today. Adjusted for inflation, however, that means electricity was over 25 times more expensive than we're now paying. And then there were the costly light bulbs, which were around the equivalent of $40.00 today. Some electric companies provided a service of "renting" each light bulb to customers for approximately $6.00 per month, adjusted for inflation. We don't know the exact arrangement and costs here in Sonoma County, as this topic was never mentioned in the papers (as far as I know), but if anyone finds great-grandma's electric bill or terms of service c. 1910, please don't throw it out! Combine the expensive light bulbs and high cost of using electricity and it's easy to conclude that most residents of early 20th Century Santa Rosa used electric lighting sparingly, probably only in certain rooms for short periods of time, or when company came calling. And it's another hat tip to James Wyatt Oates' wealth and extravagance that so many light fixtures were installed when his great house was built. Where new bulbs came from was another one of those missing-picture mysteries; the stores that sold lighting fixtures never advertised they had the best and brightest bulbs, or any bulbs for sale at all. Yet the Press Democrat's 1904 promo insert mentioned that there were 12,000 incandescent lights in use around town. How on earth did they know the precise count? It's been quite the head-scratcher. The answer comes from a government report from this period, which explains light bulbs were available only though the local electric utility company. Bulbs were delivered to your home or business, and some companies even screwed in the replacement bulbs for you. That explains another small puzzle; a previous article had mentioned a "lineman [would] answer lamp kicks at all hours of the night," which now is apparent that it meant PG&E would send someone out pronto to replace your burned-out bulb. Between the government report and a 1909 item in the Press Democrat, it's also now understood how street lighting worked in that era. All I knew heretofore is that they used electric lights and not gas. But how many lights were on each street, and how many overall? With the exceptions of commercial districts like Fourth street, it appears lights were only found at intersections. The PD noted that "100 watt Tungsteins" [sic] were being added to fifteen intersections, and the federal report mentions lamps were usually suspended by wires 25 feet over the center of an intersection. It was a good idea to live in the middle of the block if you didn't like night lights. As a final note, the report also observed that repairmen often attempted to fix burned out light bulbs before replacing them. Their technique was turning the bulb on and shaking it vigorously, in hopes that the broken filament would reconnect to the ultra-hot (3410 degrees centigrade) coil and flash weld itself again in place. Kids, please don't try this at home unless you're a certified light bulb repairman. By special arrangement with the publisher a number of copies of Darms' Illustrated Portfolio of Santa Rosa and Vicinity have been placed on sale at the Chamber of Commerce for the low price of $1.00 per copy. In spite of the fact that the regular price of this beautiful book is $3.75, the supply now on hand at the Chamber of Commerce headquarters will be sold without reservation for $1.00 while they last, and it is hoped that as many copies will be purchased and sent out as possible. The book is beautifully printed and elaborately illustrated, and various parts of the county are represented. The book would make an acceptable present for anybody, particularly friends living in the east. The cost of mailing is 26 cents. A number of additional lights are being placed at the corners of a number of dark streets in different parts of the city. H. W. Jacobs is installing the lights for the city and already has eleven in position. The lamps being used are 100 watt Tungsteins, eighty candle power each.